ISPD Fellowship Program – deadline extended to apply for round 1 of 2018! 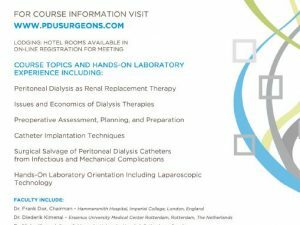 International Society for Peritoneal Dialysis > What's New > ISPD Fellowship Program – deadline extended to apply for round 1 of 2018! Did you miss your deadline for applying to the first round of the ISPD Fellowship program in 2018? Don’t worry! In order to accommodate the requests of people who had problems to apply due to the Easter Holidays, we have extended the deadline to apply for the first round of grants in the ISPD Fellowship Program for 2018. The new deadline to submit applications is now Thursday April 19th, 2018. Click here to view full details about the program and application process. Please note that the funding for each one of the applicants has been increased up to 5.000USD. Apply for the ISPD European PD University for Surgeons! The purpose of this Society will be to advance knowledge of peritoneal dialysis and to promote advancement of such knowledge through international scientific meetings and scientific publications.